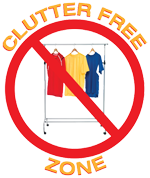 QuikCLOSET’s space saving design will allow you to use only the required hanging space that you need at any given time, whether it be 12”, 24” or up to 48” of heavy duty clothes storage space while keeping your floors clear. Create 3’ to 5’ of instant clothes storage anywhere! Made of ABS plastic and stainless steel rods, this uniquely designed weather proof clothes storage system will create temporary or permanent clothes storage. Excellent for organizing the laundry room, extra clothes hanging space when company arrives, the patio for organizing wet towels and swim suits by the pool or hot tub, seasonal clothes storage or general use throughout the home. Start with two InstaHANGERS that support the telescopic closet rod. 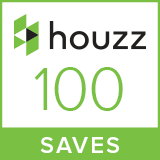 Each of these space savers provide 12″ of hanging space and fold flat to just 1 1/4″ thick and can be used independently to dry or store clothing. Once you have installed the two InstaHANGERS up to 5 ‘ apart and join them with the telescoping closet rod, you’ve created the 120 lb capacity QuikCLOSET. 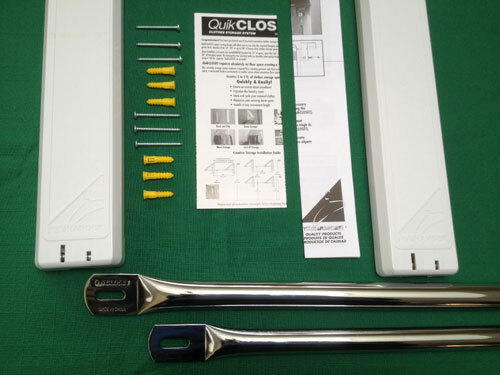 Telescopic rod installs or removes easily in seconds and units close flat against the wall. 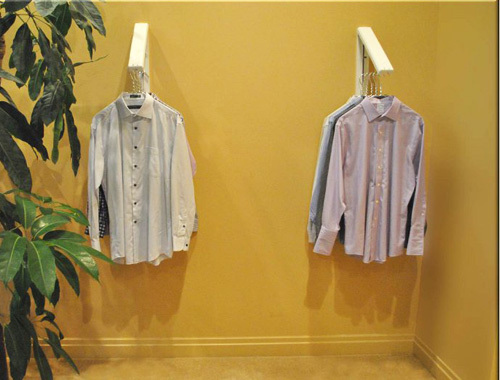 This versatile storage system replaces a typical floor standing garment rack that occupies 8 – 10 sq. ft. of floor space creating a “Clutter Free Zone”, a welcomed feature particularly in smaller rooms where maximum floor space is a necessity. The handy quick reference drawing provides mounting dimensions for creative upper and lower installations to maximize existing closet space. 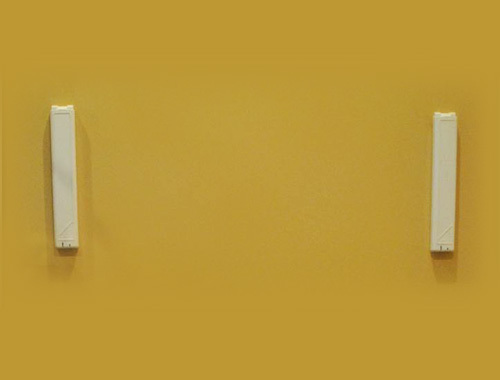 Easy to install with little effort, includes mounting template & hardware. 1 Telescopic hanging rod adjustable 3-5 feet (1.2M – 1.5M). Instructions, mounting hardware, and mounting template. *Maximum spacing between two InstaHANGERS for heavy storage is 4 feet. * Mount InstaHANGER brackets to solid bearing such as wood studs or masonry walls. *Maximum spacing for drying and ironing is 5 feet. Install 2 InstaHANGERS at required or desired height (refer to back of Installation Template for InstaHANGER Installation Instructions. Extend the telescopic hanging rod longer than necessary and temporarily rest the rod onto the kinked portion (resting position) of both InstaHANGER hanging rods. On one InstaHANGER, remove the end of the hanging rod from the wall mounted section by sliding the rod up & out of the entry slot of the molded sliding channel with one hand, while holding the end of the telescopic rod with your free hand. Slide the slotted end of the telescopic rod over the end and onto the InstaHANGER hanging rod. Reinsert the end of the hanging rod back into the entry slot & allow it to slide back down to its resting place. Repeat steps 4 and 5 with the other InstaHANGER. Slide the telescopic rod along the hanging rods to the kinked resting position. 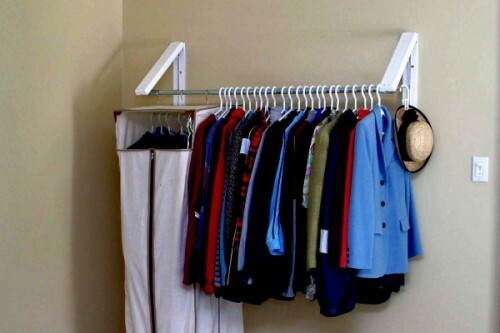 *NOTE For best results, allow 12” of clear wall space on either side of the QuikCLOSET to provide hanger clearance for each InstaHANGER bracket when the telescopic rod is not being used. 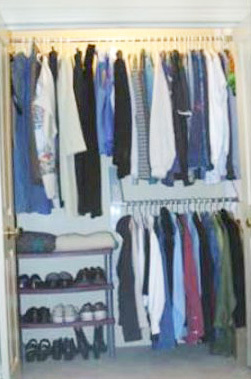 Example – For a 48” wide QuikCLOSET, allow 72” of clear wall space. 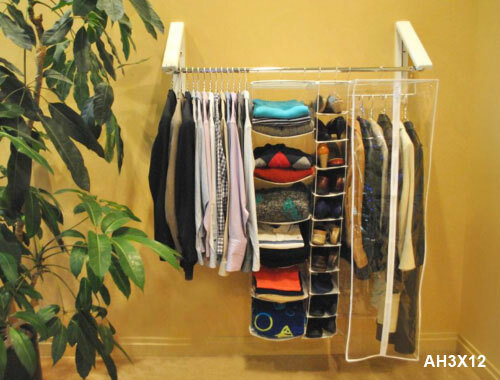 Creates 3 to 5 feet of clothes storage space anywhere!